The start of Peyton’s time of the month and my time of the month have coincided on the same day. Peyton got her first dose of steroids as all that girly-bit nonsense decided to commence. This could bring about any interesting number of conflicts or the universe could just implode….watch and see. We are both hungry, cranky, moody and slightly tilting off our collective rocker. I think NOW would be a great time for Nathaniel and Rachael to decide to run…not walk…for the nearest fallout shelter. On our way home from the clinic yesterday I felt the building of a catastrophic migraine starting. I think I drove the last couple of miles home by THE FORCE. I got all the kids into the house and promptly went all Excedrin-junkie and laid down on the couch. Feeling a little guilty because Peyton had just had a major chemo dose and I was the one face down on a pillow. Luckily I caught it before it got too bad, but when Peyton crawled up next to me and we spooned together in our little nest of self-pity, it was a true bonding moment. We are both feeling better this morning. Neither of us feel compelled to get dressed or actually produce MOVEMENT of any kind, but better. It’s one of those days the two of us could happily lounge in bed all day with a book/movie and a bag of Cheetos/bowl of cream cheese and be perfectly content. Be proud of us, we’re at least making the most minimal effort. I posted this update and Peyton drew this picture that perfectly showcases our family and how she feels about us. My first thought was that we were a family of cannibals. Wild, crazy, tribe-dwellers. Not completely off the mark. 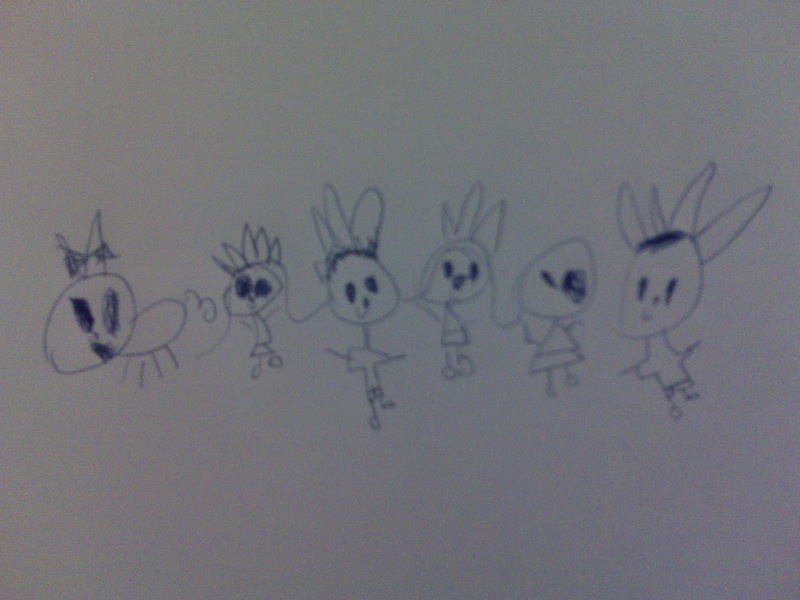 But it turns out that we are indeed a family of prines and princesses….those are crowns on our royal heads. Except Rachael. I asked her what was up with her sister’s princess. This is apparently the 4 year old version of a voo-doo doll. Posted in: adventures at the clinic, Mayhew niblets, Mom memoirs, Peyton treatments, the cancer life, things our kids do. ← What do you do when you don’t know what you want to do? My, what big eyes you have. All the better to see inside yourselves with, I suppose…. Fun post! HAHA! I love this post! You are truley a gifted writer.